Heat the oil in a medium-sized frying pan over medium heat. Once the oil is hot, stir-fry the onion for 3-5 minutes, or until translucent. Add the garlic and fry for an additional minute. Incorporate the mushrooms and cook until soft and lightly golden brown. Remove from pan and set aside. Clean the frying pan with a paper towel and heat the pan again. Prepare the quesadilla by laying down 1 layer of cheese, a layer of mushrooms, and a final layer of cheese between 2 tortillas. Set the quesadilla in the frying pan and cook for 3-5 minutes on each side, or until the tortillas are golden brown and the cheese has melted. Repeat the layering process to prepare the other quesadilla. Serve immediately with a side of tasty Progresso™ soup. Swap out the Swiss cheese for mozzarella or havarti cheese. Mushrooms are an excellent option when you don’t want to cook meat. 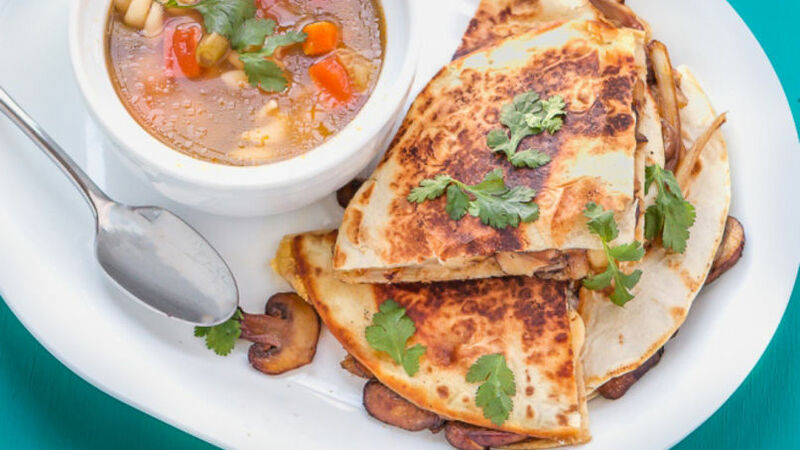 These quesadillas with mushrooms and Swiss cheese won’t disappoint! They’re easy to make and you can have a tasty meal on the table in a matter of minutes. You can even cut the quesadillas into smaller portions and serve them as an appetizer at your next gathering. I’ve paired the quesadillas with a side of Progresso™ soup, since there’s nothing better on a chilly day than a warm bowl of soup! Enjoy!